When I first started researching becoming a truck driver, I knew I'd be spending a lot of time alone. Believe it or not, this was actually something I was looking forward to. It's not that I dislike people or anything like that, I've just always been the type that doesn't mind being alone. It's almost therapeutic. However, this isn't the case for everyone, and I'm here to tell you what it's like being a solo truck driver, all alone. 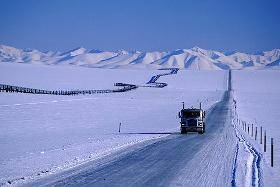 As you can imagine, I spend most days in complete solitude as a long haul truck driver. I may speak with somebody in the shipping or receiving office at a customer, I might speak with a clerk at a truck stop, and I might say a few words on the CB radio to other truck drivers from time to time, but for the most part, it's just me and the road. If you're considering becoming a truck driver, you have to really think about this. How well will you handle it? In the short time I've been driving, I've metsome truck driverswho seem to literally be going insane, partially because of the isolation from other people. I spend at least 4 weeks out on the road at a time....alone. I never see anybody I know during those 4 weeks. Everyone I come in contact with is a total stranger, in a place I'm not familiar with, and generally, they aren't completely fond of truck drivers. I'm just somebody who creates more work for them, and they've probably had a few bad experiences with truck drivers that very same day. Truck drivers lead a fairly stressful life, and many drivers take it out on unsuspecting people, like the shipping and receiving workers. After all, they don't have anyone else to vent to. Those workers, in turn, show a lack of respect towards the rest of us, and in a way, you can't really blame them. Those I come in contact with are not my buddies, and don't really care about me at all. Their goal is to get me loaded or unloaded, give me my fuel receipt, bring me my food, etc., then get me off their property. It's just business, nothing more, nothing less. This is something that I, and all OTR truck drivers, deal with for weeks at a time. And I'm not talking about 5 day work weeks. I mean 30 days straight, 24 hours a day. After we put in those weeks of solitude without contact with anyone we know, we are rewarded with 4 or 5 days off at home before it's time to hit the road again. It isn't simply being alone that is hard. It's missing those back at home. Sitting alone in the cab of a truck gives you a lot of time to think and reflect. I am a single guy without a family back home, so it's a bit easier on me than with others who have a husband / wife and kids back home. But I do think about my friends and family and what they are doing. I do think about the days when I could go home from work and crack open a beer with my best friendwhile I watch the Cubs game on a big screen TV. I do think about going out on the weekends, or just sitting and having a nice chat with my parents on their screen porch on a nice evening. I do think about taking a spur of the moment trip to Chicago or the North Woods of Wisconsin. And boy, do I miss the home cookin'. All of those things are behind me, at least as long as I'm a long haul truck driver. Could you deal with that? It's not all doom and gloom though. If you have the right personality and can make some big sacrifices in your life like the ones I mentioned above (among others that are more personal to you), this can be a great life. Personally, I absolutely love cruisin' down the highway chasing the sunset with the radio turned up. I love the self reflection provided when I turn the radio off, and just think. It's amazing what the mind does when there's nothing to do and nobody around. It provides for a type of therapy that only a truck driver can understand. I love when I happen to come in contact with real great people here on the road, be it a fellow truck driver or a random person. I never know when it's going to happen, but when it does, it's usually a person I'll never forget, even if we only spend 20 minutes together. Some of the most interesting people I've met in my life, I've met on the road. Times have changed for the truck drivertoo. And it has changed for the better as far as isolation goes. The way technology is these days, it's much easier to connect with people and reach the outside world. Today I've been surfing the web in the middle of Oklahoma using a wireless broadband card (the company I use is Millenicom and I'm very happy with them so far). Email is such a great way to keep in touch and is a truck drivers best friend these days.I can virtually do that anywhere I go with my broadband card. Feel free to send me an email - my email address is listed at the top of the page under the article title! It may take me a day or two to respond, but I'll always get back to ya!Another way I love to communicate with people is right here on ourtrucking forum at TruckingTruth. When I first entered the industry, I decided to get an iPhone for the road. Man am I glad I did! I can pick up my iPhone to call a friend or even access my Facebook account- you can send me a friend request! I can turn on the TV to watch the news, pop a movie into my DVD player, or even use my Webcam to talk with friends, family, and anybody else who wants to chat. I absolutely love my satellite radio as well. And of course, I love to share my life with the worldthrough my trucking blog.There are many ways for the modern day truck driver to communicate with the outside world, take advantage of it! Truck drivers like myself who are just getting into the industry have it much easier than those who were out on the road just 10 years ago. I can't imagine what it was like for them. I've said it before, and I'll say it many times more in the future. This is not a job, it is a lifestyle. If this is a career you want to get into, you must be absolutely sure your personality is a perfect match for this kind of life. I can truly say with 100% honesty that I don't think most people should do this job and live this life. Not because they can't, but because they wont like it. And the statistics prove this. The turnover in this industry is very high because people simply aren't prepared for the life they are going to live. The job itself is tough, but most people are capable of doing it. The lifestyle is what truly separates those who will succeed, and those who will be back home within a year, looking for that 9 to 5 job. You are not on vacation here. And even when you are enjoying yourself on the road, you are enjoying it alone. If you're reading this blog and are interested in truck driving, you're doing the right thing. Researching. Keep doing that and keep an open mind. Be honest with yourself about whether or not this is truly for you. It might be, and it might not be. But if you truly believe you are a good fit for this career, my advice is to absolutely go for it! I had a sneaking suspicion I would be happy as a truck driver, and I was right. This was probably one of the best decisions I've ever made for myself, and I couldn't be happier. My home is the truck, my life is the road, and my best friend out here is myself. I love this life. Will you?